Home | New Releases | Mort Kunstler Handsigned and Numbered Limited Edition Giclee on Canvas:"The First Pledge of Allegiance"
Mort Kunstler Handsigned and Numbered Limited Edition Giclee on Canvas:"The First Pledge of Allegiance"
About the Art: Two centuries of conflict came to a climax in the mid-eighteenth century in what Europeans called the Seven Years War and Americans the French and Indian War. It was waged by the soldiers of France and England, by hastily recruited colonials and French Canadians, by a score of Indian tribes, and by backwoodsmen and Indian fighters like Robert Rogers and his Rangers, who seemed to show up wherever the fighting was hottest - and the rewards most lucrative! Rogers's untrained, almost savage followers fought with Governor Johnson at Fort Niagara, with General Amherst at Crown Point and Ticonderoga, and at distant Michilimakinac at the junction of Lake Huron and Lake Michigan - a thousand miles to the west - and in the final battle of the war, the capture of Montreal in 1760, and then, even after France had succumbed, against Chief Pontiac and his Indian "rebels." That victory meant that the English-speaking peoples could long dominate most of North America; it meant, too, the beginning of the end of Old World dominion over the New. All that took another century or more - a century that saw the independence of the United States and of the states of Latin America, the elimination of Russia from Alaska, and, with the Spanish American War, the final disappearance of Spain from the New World. 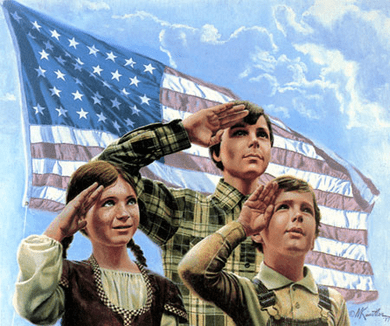 Home | Fine Art Prints & Limited Editions | Applejack Gallery | Mort Kunstler | Mort Kunstler Handsigned and Numbered Limited Edition Giclee on Canvas:"The First Pledge of Allegiance"
Home | Fine Art Prints & Limited Editions | Civil War Gallery | Mort Kunstler | Mort Kunstler Handsigned and Numbered Limited Edition Giclee on Canvas:"The First Pledge of Allegiance"